This is my first look of October and it's all about my snow leopard pumps. I've found the perfect shoes to add more fun and spice to my outfits. I'm really thrilled with this particular pair, because besides their classic print, they also fit perfectly around my heel area. I'm always looking for brands that make shoes narrow-heel friendly. The gap in the back of my shoes has always been a problem for me, so when I find shoes that fits decently around my heels, I stick with their brands. Este es mi primer vistazo de Octubre y se trata de mis tacones de leopardo de nieve. He encontrado los zapatos perfectos para añadir más diversión y sabor a mis trajes. La verdad es que estoy muy emocionada con este par en particular, porque además de su impresión clásica, también encajan perfectamente alrededor de mi área del talón. Siempre estoy en busca de marcas que hacen zapatos estrechos en el área del talón, ya que siempre he tenido el problema de tener un brecha en la parte de atrás, así que cuando encuentro un calzado que se ajuste decentemente alrededor de mis talones, le soy fiel a esos diseñadores. Pumps/Tacones: Saint Laurent. Available here on sale. 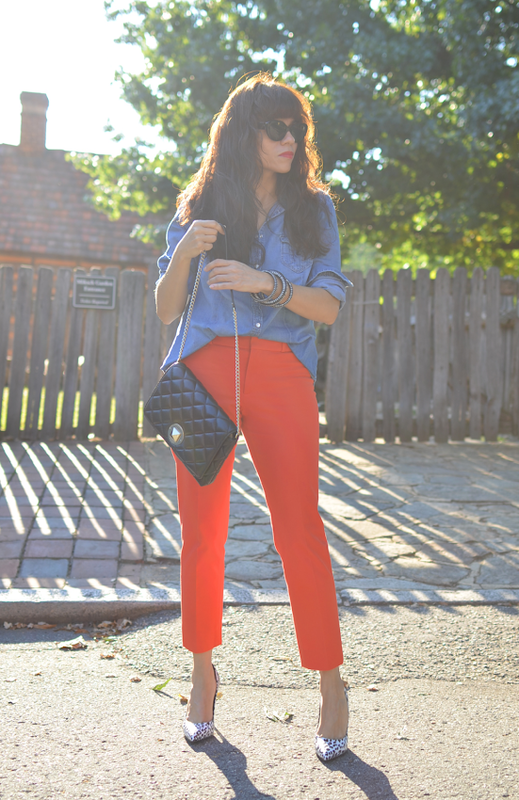 Another look that I am going to copy from you Carelia, just bought a Chambray shirt and wasn't quite sure what to do with it. 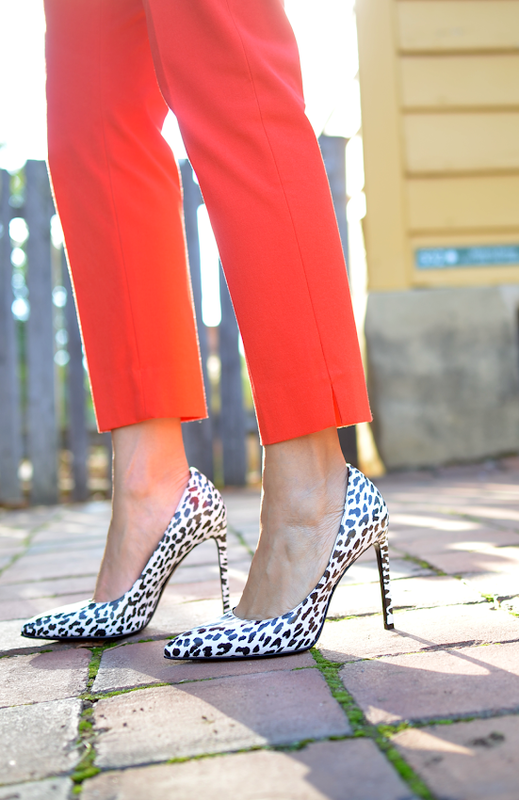 I am off to my closet to find my Red pants and Leopard print shoes...... love the look!!! Thanks Nicolene! I'm glad I can help, but knowing your creative style, I'm sure you will find several ways to wear it. Thanks beautiful! 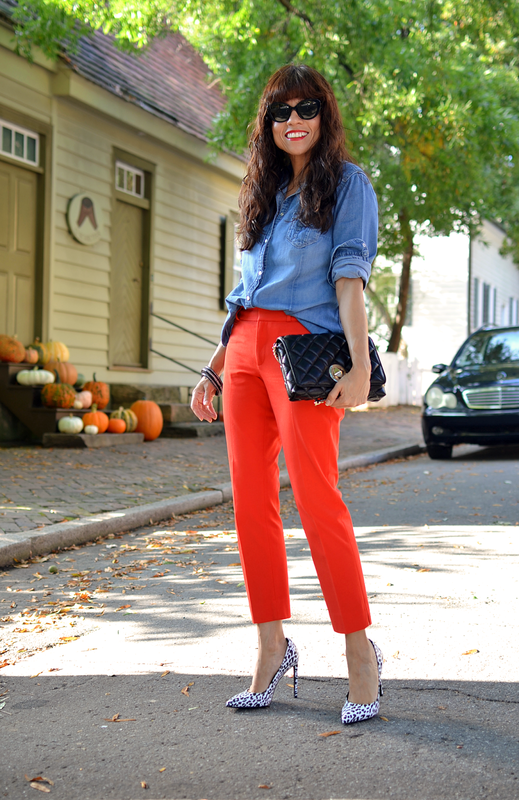 The first thing I wanted to do after I bought these shoes was to wear them with these orange pants. Now, I'm pleased lol. I think I'm going to copy this outfit. These pictures are great! The first one is just fabulous. Thanks Ann! The first one was my idea, for once I can say that lol. Me encanta el mix de color del look Carelia!! preciosos los zapatos en print animal. Gracias Iván! Me alegra que te guste la combinación. Perfection. I love this look. Very effortless and on point, and the shoe just takes it to a whole new level.